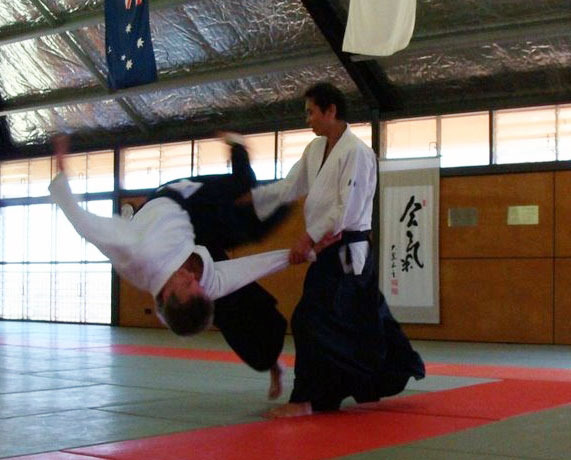 The following vocabulary list is by no means complete, but it contains some of the more commonly encountered terms one may encounter during an aikido class. Atemi = (lit. Striking the Body) Strike directed at the attacker for purposes of unbalancing or distraction. Atemi is often vital for bypassing or “short-circuiting” an attacker’s natural responses to aikido techniques. The first thing most people will do when they feel their body being manipulated in an unfamiliar way is to retract their limbs and drop their center of mass down and away from the person performing the technique. By judicious application of atemi, it is possible to create a “window of opportunity” in the attacker’s natural defenses, facilitating the application of an aikido technique. “Atemi” can also have the connotation of a “vital strike”. As such, it is important that the strike be delivered to a vulnerable target and with sufficient force as to eliminate the attacker’s ability or willingness to continue the assault. Dan = Black belt rank. In the International Aikido Federation (IAF), the highest rank it is now possible to obtain is 9th dan. In the Fuji Ryu Aikido Federation the highest practising dan grade is 6th dan. There are some aikidoka who hold ranks of 10th dan. These ranks were awarded by the founder prior to his death, and cannot be rescinded. White belt ranks are called kyu ranks. Fudo shin = “Immovable mind.” A state of mental equanimity or imperturbability. The mind, in this state, is calm and un-distracted (metaphorically, therefore, “immovable”). Fudomyo is a Buddhist guardian deity who carries a sword in one hand (to destroy enemies of the Buddhist doctrine), and a rope in the other (to rescue sentient beings from the pit of delusion, or from Buddhist hell-states). He therefore embodies the two-fold Buddhist ideal of wisdom (the sword) and compassion (the rope). To cultivate fudo shin is thus to cultivate a mind which can accommodate itself to changing circumstances without compromise of principles. Furi kaburi = Sword-raising movement. This movement is found especially in ikkyo, irimi-nage, and shiho-nage. Jo = Wooden staff about 4′-5′ in length. The jo originated as a walking stick. It is unclear how it became incorporated into aikido. Many jo movements come from traditional Japanese spearvfighting, others may have come from jojutsu, but many seem to have been innovated by the founder. The jo is usually used in advanced practice. Kamidana = A small shrine, frequently located at the front of a dojo, and often housing a picture of the founder, or some calligraphy. One generally bows in the direction of the kamiza when entering or leaving the dojo, or the mat. Kamiza = a term used in Japan to refer to the ‘top seat’ or important side within a room. The opposite term referring to the ‘bottom seat’ within a room is Shimoza. Ki = Mind. Spirit. Energy. Vital-force. Intention. (Chinese = chi) For many Aikidoka, the primary goal of training in aikido is to learn how to “extend” ki, or to learn how to control or redirect the ki of others. There are both “realist” and anti-realist interpretations of ki. The ki-realist takes ki to be, literally, a kind of “stuff,” “energy,” or life-force which flows within the body. Developing or increasing one’s own ki, according to the ki-realist, thus confers upon the aikido-ka greater power and control over his/her own body, and may also have the added benefits of improved health and longevity. According to the ki-anti-realist, ki is a concept which covers a wide range of psycho-physical phenomena, but which does not denote any objectively existing “energy” or “stuff.” The ki-anti-realist believes, for example, that to “extend ki” is just to adopt a certain kind of positive psychological disposition and to correlate that psychological dispositon with just the right combination of balance, relaxation, and judicious application of physical force. Since the description “extend ki” is somewhat more manageable, the concept of ki has a class of well-defined uses for the ki-anti-realist, but does not carry with it any ontological commitments beyond the scope of mainstream scientific theories. Musubi = “Tying up” or “uniting”. One of the strategic objectives in applying aikido techniques in to merge with (= musubi) and redirect the aggressive impulse (= ki) of an attacker in order to gain control of it. Thus “ki musubi” or “ki no musubi” is one of the goals of aikido. There is a cognitive as well as a physical dimension to musubi. Ideally, at the most advanced levels of aikido, one learns to detect signs of aggression in a potential attacker before a physical assault has been initiated. If one learns to identify aggressive intent and defuse or redirect it before the attack is launched, one may achieve victory without physical confrontation. Also, by developing heightened sensitivity to the cues that may precede a physical attack, one thereby gains a strategic advantage, making possible pre-emptive action or, perhaps, escape. This heightened sensitivity to aggressive cues is only possible as a result of training one’s awareness as well as one’s technical abilities. Randori = Free-style “all-out” training. Sometimes used as a synonym for jiyu waza. Although aikido techniques are usually practiced with a single partner, it is important to keep in mind the possibility that one may be attacked by multiple aggressors. Many of the body movements of aikido (tai sabaki) are meant to facilitate defense against multiple attackers. Reigi = Ettiquette. Observance of proper ettiquette at all times (but especially observance of proper dojo ettiquette) is as much a part of one’s training as the practice of techniques. Observation of reigi indicates one’s sincerety, one’s willingness to learn, and one’s recognition of the rights and interests of others. Shimoza = a term used in Japan to refer to the ‘bottom seat’ or least important side within a room. The opposite term referring to the ‘top seat’ within a room is Kamiza. Shoshin = Beginner’s mind. Progress in aikido training requires that one approach one’s training with a mind that is free from unfounded bias. Although we can say in one respect that we frequently practice the same techniques over and over again, often against the same attack, there is another sense in which no attack is ever the same, and no application of technique is ever the same. There are subtle variations in the circumstances of every interaction between attacker and defender. These small differences may sometimes translate into larger differences. To assume that one already knows a technique constitutes a “locking in” of the mind to a pre-set dispositional pattern of response, resulting in a corresponding loss of adaptability. Prejudgment also may deprive one of the opportunity to learn new principles of movement. For example, it is common for people upon seeing a different way of performing a technique to judge it to be wrong. This judgment is frequently based on a superficial observation of the technique, rather than an appreciation of the underlying principles upon which the technique is based. Ueshiba Moriteru = The grandson of the founder and current aikido (2007). Common Attacks Katate tori (also katate mochi) = One hand holding one hand. Basic Techniques ikkyo (ikkajo / ude osae) = omote and ura (irimi and tenkan). Throws Irimi nage (also kokyu nage) = Entering throw (“20 year” technique).